I HAVE PLAYED a million shows on a million stages. Stages are big, small, rickety, built up and torn down, and part of the show. If you are in a venue, and there is a stage, you play on the stage. The Cheeseburgers just played at The Party Cove near Mark Twain Lake. It has the biggest stage we've ever been on - huge. There's lots of room and it felt good to roam around. I've played on stages so rickety our stuff fell off. One particular Catholic parish picnic party comes to mind. Another night we were in front of the Quincy Boat Club and Marty Tappe save my amp from falling off the wobbling flatbed trailer about seven times. Last Tuesday in LaHarpe, The Cheeseburgers played for the community fireworks show and we had a trailer for a stage. We put our drummer and keyboard player up there, and the other three guys stood in the grass in front of the trailer. I thought it looked really cool and we loved how it worked. 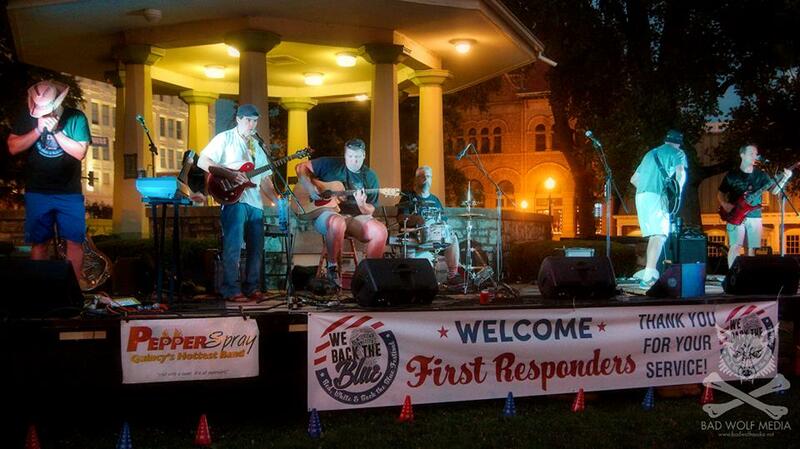 Thursday night we played for the Quincy Park District's summer concert series in Washington Park. We set up in front of the gazebo. It was more efficient and I think we were more accessible for the crowd, and it was a really good crowd for a weeknight. I loved having the room and not worrying about tripping over something on a stage. I understand going on the gazebo when it is Blues In the District, and 3,000 of your closest friends are in front of you. Saturday night Pepper Spray played in the exact same Washington Park spot. This time we had a huge flatbed trailer for a stage. It was donated and I appreciated all the hard work and effort that went into the Back The Red, White and Blue Festival - we had a blast and a lot of people enjoyed it. Several people mentioned they liked the stage with the gazebo as a backdrop, and again, we had a lot of fun playing. All the world is a stage, right? This weekend The Cheeseburgers play a private party at The State Room in Quincy, an amazing venue with a wide but not deep stage, and I can't wait to get up there and rock it to the ground again!